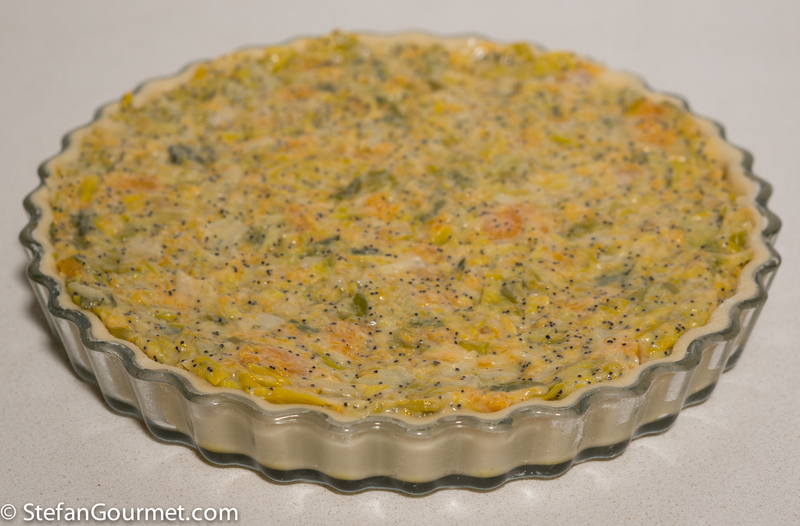 When Paola presented this savory tart on her blog she suggested to make this quickly before Spring arrives, as this leek and squash tart is more suitable for Winter. 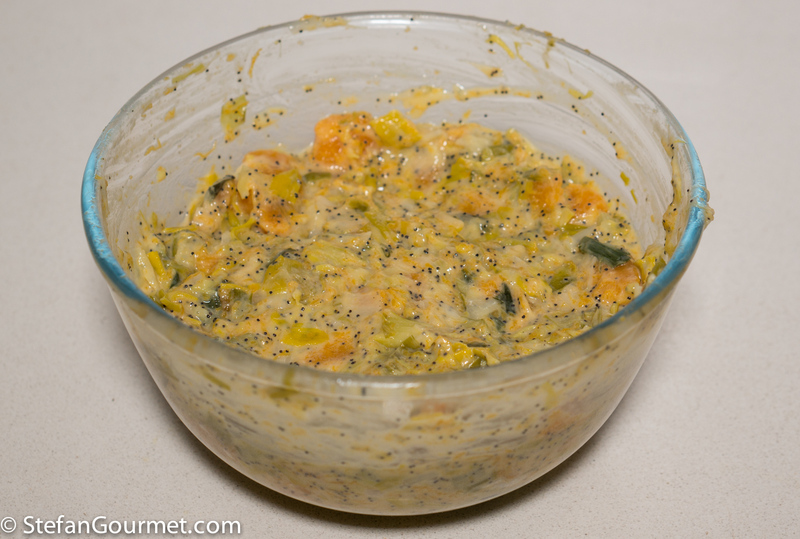 I was intrigued by the combination of leeks and squash, as well as poppyseed, and so I followed her advice and prepared it right away. 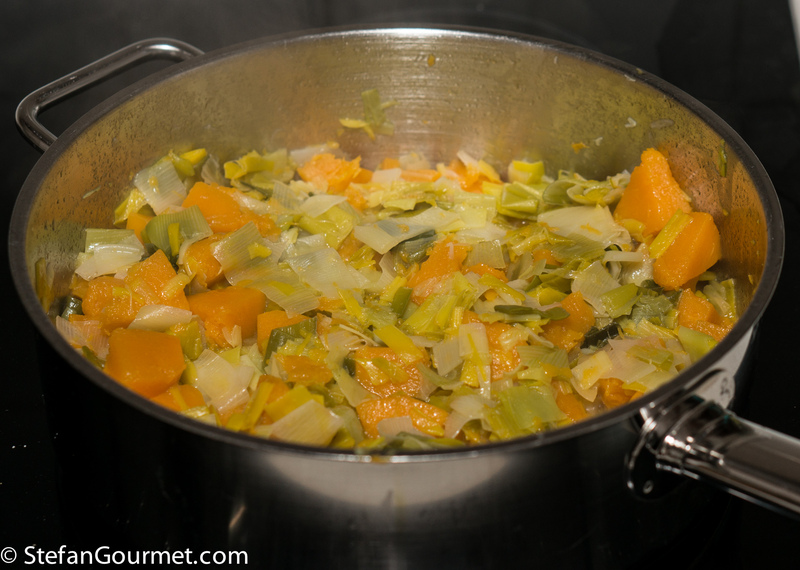 It turned out great: the sweet flavors of the squash and leeks blend very well and I expect it will be even better earlier in the season when squash is still at its prime. 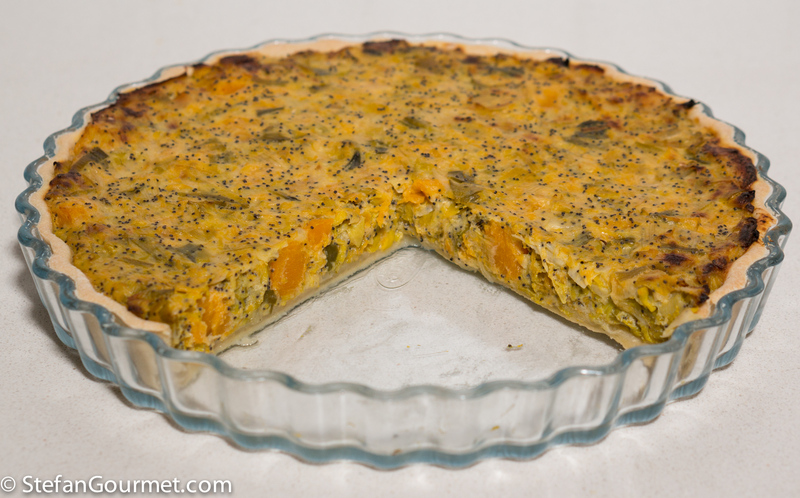 The nice thing about this tart is that it is not only delicious but also healthy as it contains mostly vegetables and ‘Italian style’ tart dough with only 2 tablespoons of olive oil instead of 7 tablespoons of butter as used in regular shortcrust pastry. It serves 2 for lunch or dinner, or 4 to 6 as an appetizer. The only change I made to Paola’s recipe is to add some parmigiano to add some heartiness and depth of flavor. Grazie, Paola! 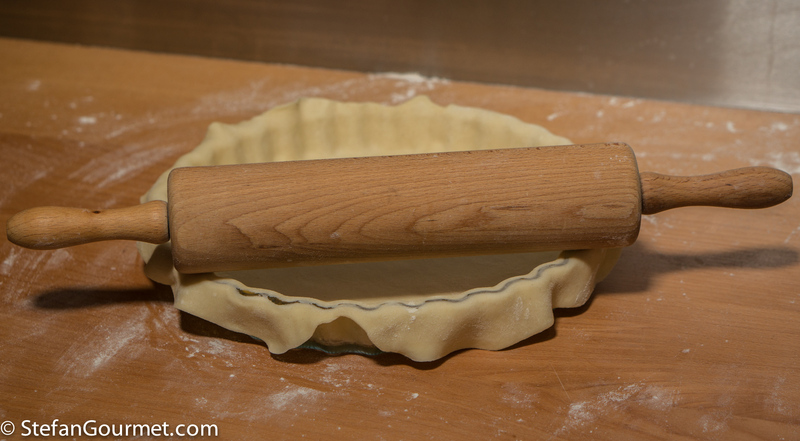 Make the tart dough according to the instructions in this post but with the amounts listed above, wrap in cling film, and allow to rest for at least half an hour. Cut the leeks in half lengthwise and then slice it, including most of the green, and wash to remove any sand. 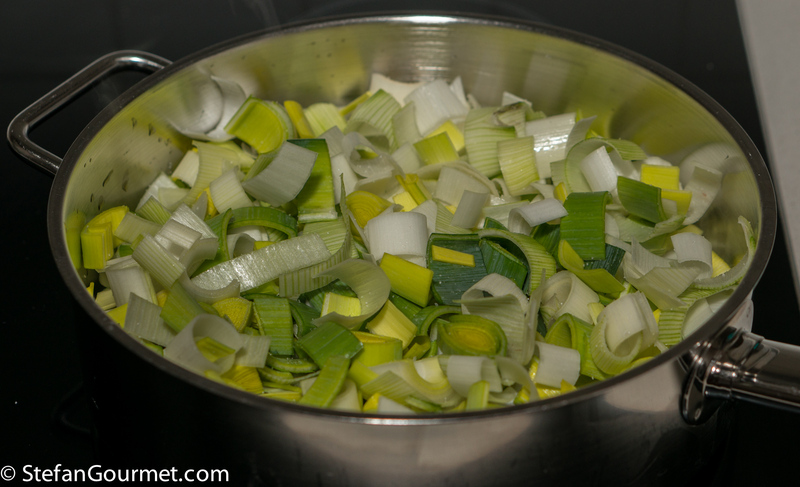 Heat 2 tablespoons of olive oil in a large frying pan or casserole and add the leeks. 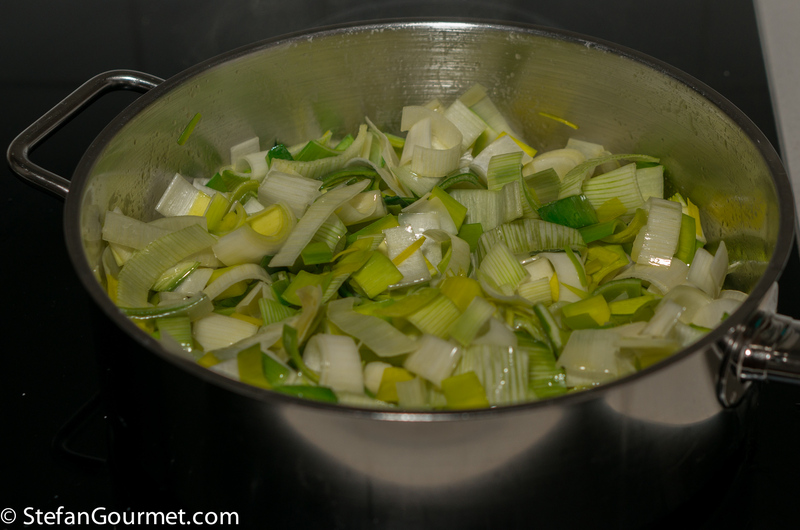 Season with salt and stir until the leeks are covered with the oil. The salt helps to release some liquid from the leeks, so they won’t burn. Cover the pan and lower the heat to medium. You don’t want to brown the leeks, just make them tender and digestible and bring out their sweet flavor. Peel the squash. 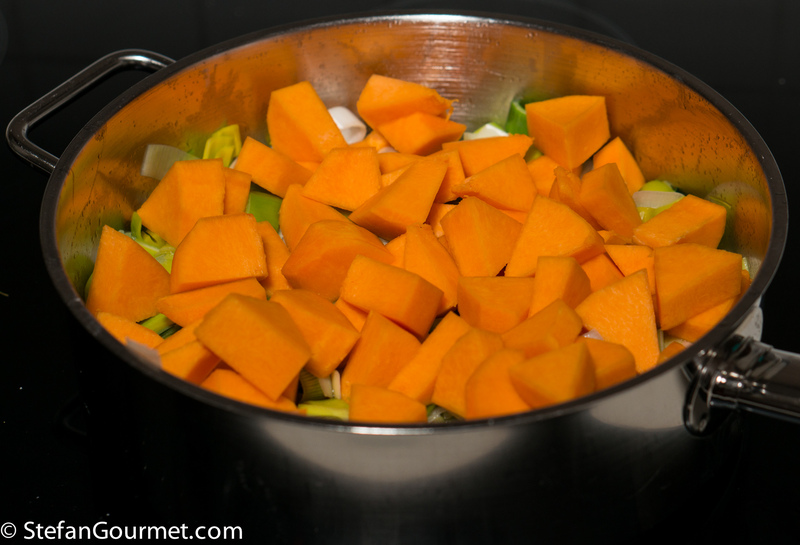 The ‘straight’ part of a butternut squash is about the right amount (500 grams). 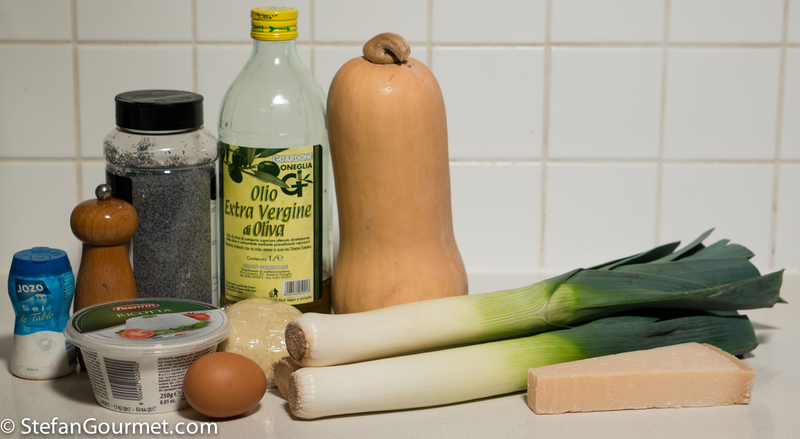 Cut the squash into pieces of about 2 to 3 cm (1 inch) and add to the leeks. Cover again and cook until the squash is tender but not falling apart, about 20 minutes. 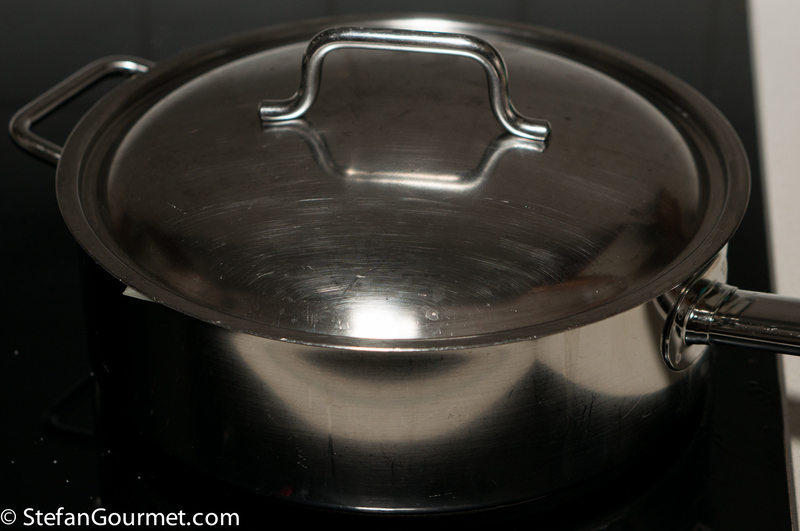 …and use it to line the tart pan. 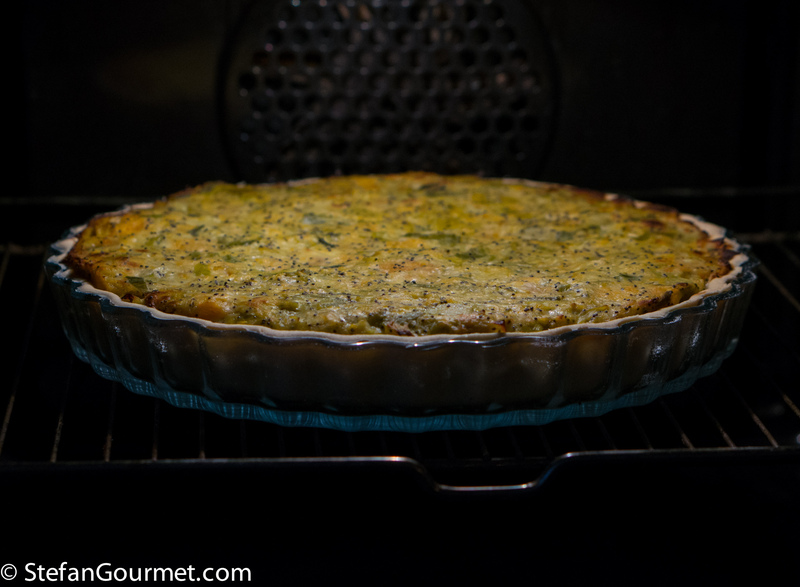 I used a 27 cm (11″) glass tart pan. 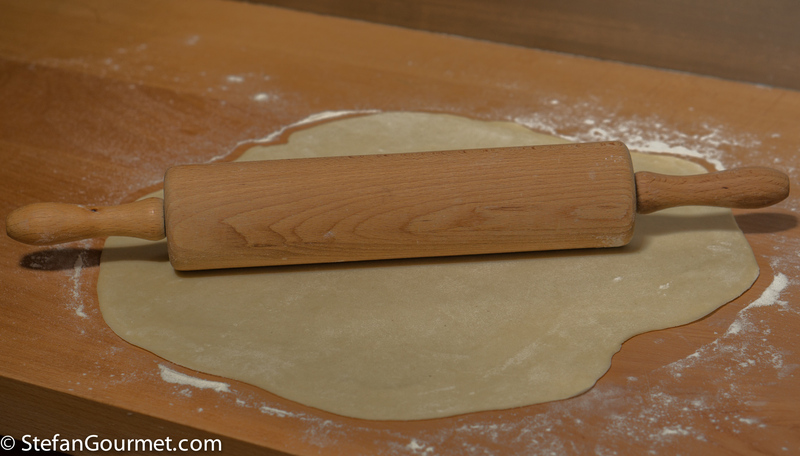 Use the rolling pin to remove the edges that stick out. Prick the bottom all over with a fork. Preheat the oven to 200C/400F (without fan) or 180C/350F (with fan). 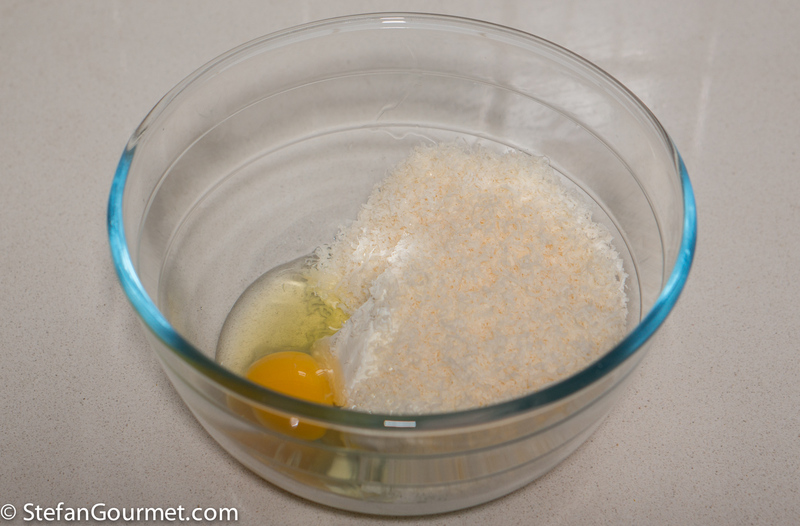 In a large bowl, combine 1 egg, 100 grams ricotta, and 50 grams grated parmigiano. Stir until the mixture is homogeneous. 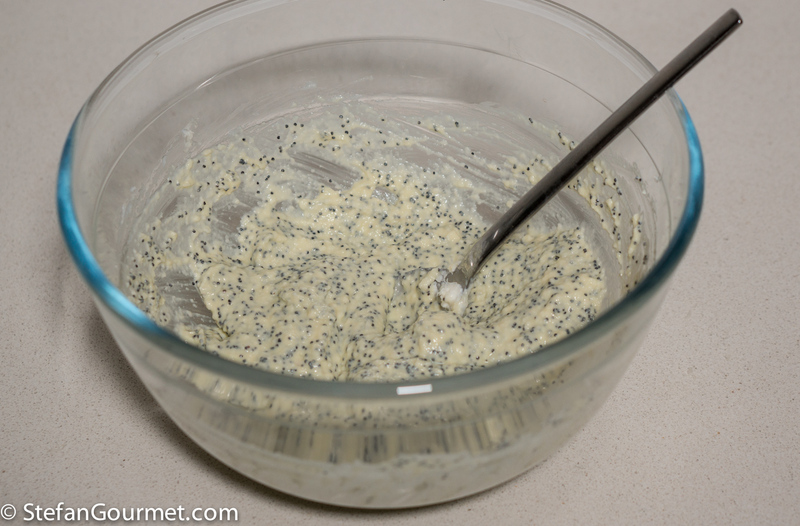 Add a heaping tablespoon of poppy seeds, and stir to mix. Turn off the heat when the vegetables are done. Allow to cool for about 5 minutes. When the vegetables have cooled down sufficiently so they won’t cook the egg prematurely, add the vegetables to the egg mixture. Season with salt (about 1/2 tsp) and freshly ground black pepper to taste, and stir well. 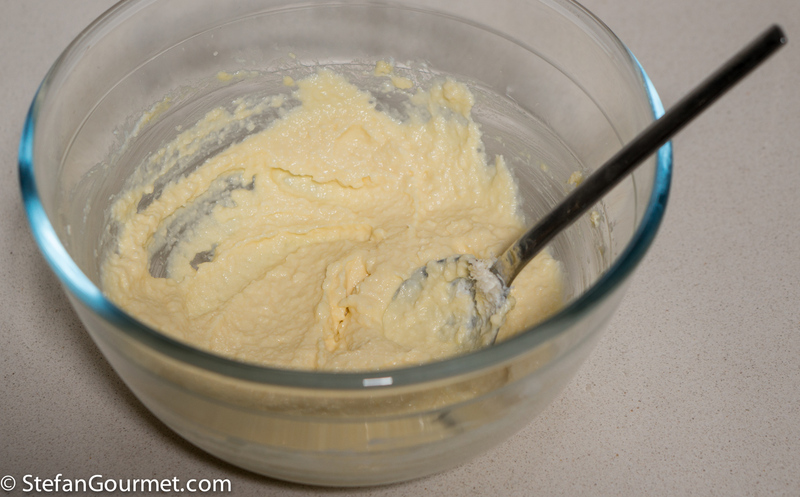 Transfer this mixture to the prepared tart pan, and flatten the top. Bake for 45 minutes at 200C/400F (without fan) or 180C/350F (with fan), or until the cake has set and the top is golden brown. Allow to cool for a few minutes before serving. 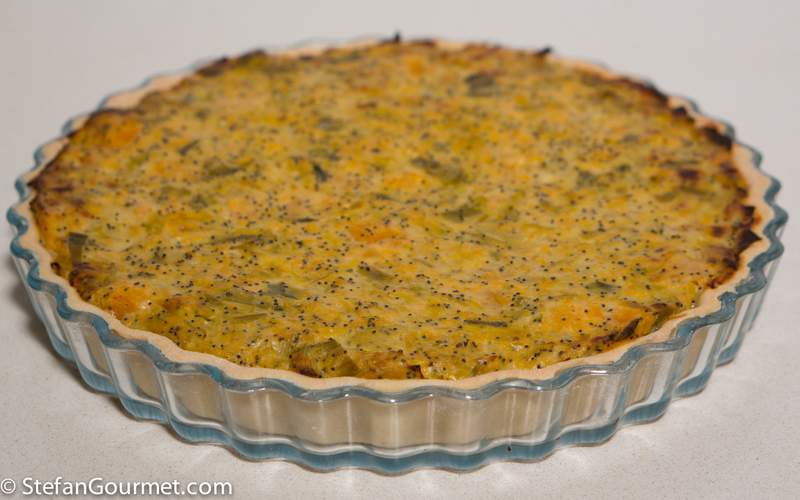 You can taste the tart better if it is not piping hot. Sounds lovely but I think it could be made even better by roasting the squash and probably the leeks as well first. Oh the wonder of world-wide cookery blogs! Reading from Australia I would naturally use ‘pumpkin’ and trying it on in Estonian learned a whole lot of new vocabulary . . . I would call it a ‘win/win’ . . . what fun!! 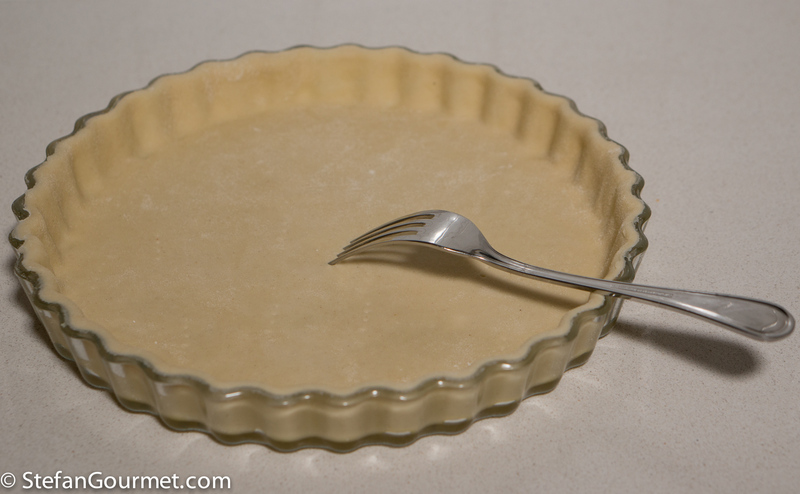 Wow that tart came out perfect! It looks like with would be very satisfying to eat. Great tart. I do a very similar one. 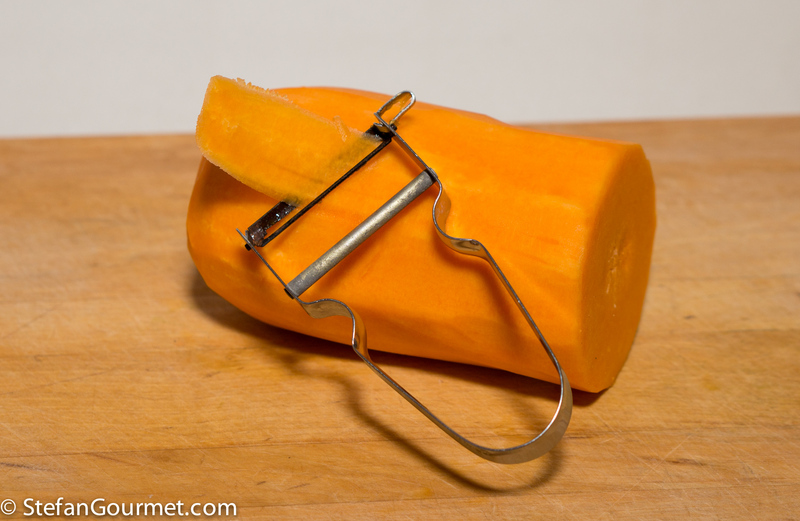 Try it with dried, roasted butternut seeds as well. 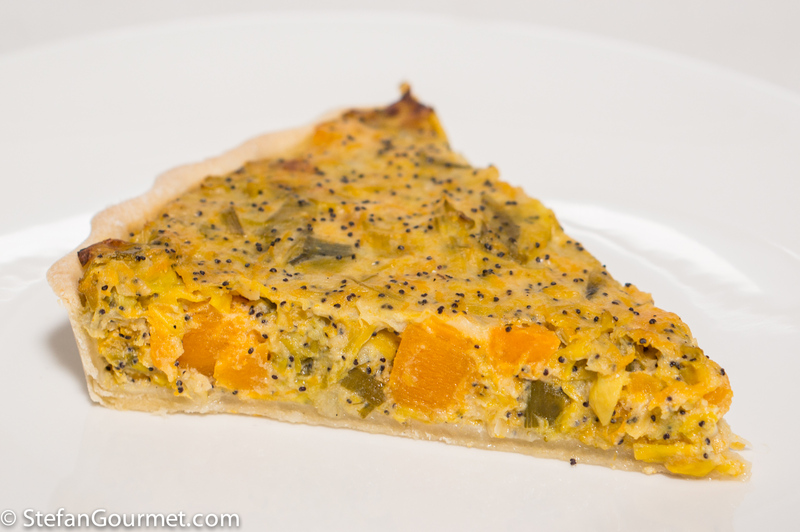 Have you tried my butternut and almond tart? I think you might like it. Don’t remember seeing it — sounds great! Zucca e porro perfettamente in armonia. I would love to try that out. I am happy to have chanced upon your blog, Stefan. I can see more yummy visions of tartlets springing up. Cheers.